The professionals at ClearVista Financial recommend that clients begin with a comprehensive financial plan that applies our Spend Life Well ModelTM to the task of determining your optimal spending and saving plan. 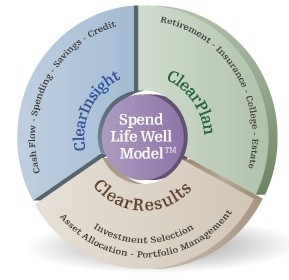 The Spend Life Well Model is a dynamic economic approach to evaluating the many possible scenarios in your real financial life. Our modeling leverages an innovative concept in economics called consumption smoothing. Consumption smoothing is a technical term that describes balancing spending and saving plans to help attain and maintain the highest possible living standard over the course of your life. The model focuses on helping to maximize your living standard over time, rather than just the size of your nest egg when your retire. This approach makes it easier to understand the costs and benefits of your financial choices, and lets you model scenarios that are interconnected, just like your real-life choices. Registered Representative, securities offered through Cambridge Investment Research, Inc., a Broker/Dealer, member FINRA & SIPC. Advisory Services offered through Cambridge Investment Research Advisors, Inc., a Registered Investment Advisor.ClearVista Financial and Cambridge are not affiliated. This communication is strictly intended for individuals residing in the states of AZ, CA, CO, MO, NY, TX, VA, WV. No offers may be made or accepted from any resident outside the specific state(s) referenced. Cambridge does not offer tax or legal advice.